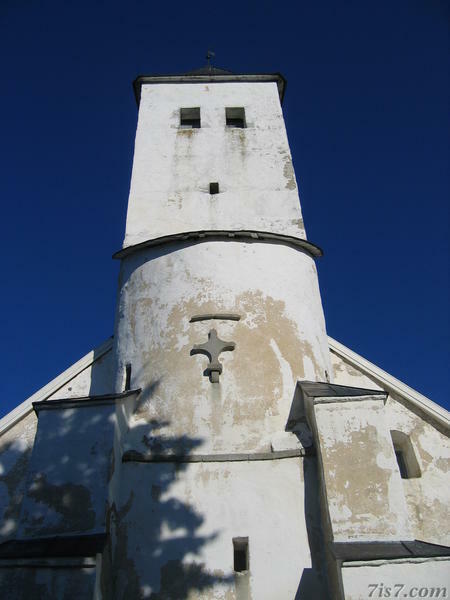 The Church of the Holy Cross in Harju-Risti is a medieval Gothic style building with a peculiar shaped tower. Construction started in the 13th century and was completed in the first half of the 15th century. The church is the eye-catcher in Harju-Risti, a village in Padise vald, some distance west of Tallinn. The church was originally built with a round tower, however during the first half of 17th century half of the top of the tower collapsed. It was only partially reconstructed giving the tower its peculiar shape. Harju-Risti's Gothic style church seen from the front. Location: 59°13'50"N 23°59'57"E on: Google Maps, OpenStreetMap, Maa Amet.